The two Texas guitarists were very different in their vocal and instrumental styles as well as in their repertoires. Lightning played both acoustic and electric blues, while Mance included ballads, ragtime songs and dance music, as well as blues, in his wide-ranging offerings. 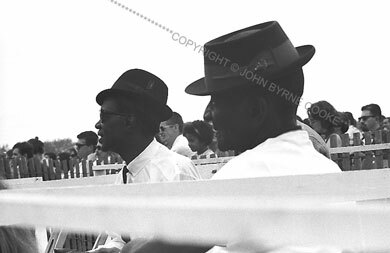 Here, they're sitting together to watch another performer at a daytime blues workshop during the 1965 Newport Folk Festival.